The amount of Unemployment Insurance benefits you receive is dependent on a number of factors, such as your past salary, amount of severance you received from a former employer, and additional sources of income. To learn more about how your benefits are calculated, read below. How much will I recieve in Unemployment Insurance benefits? How many weeks of benefits and I eligible for? When I left my job, I was given a severance package. Will this affect the amount of my UI benefits? I collect a pension from a prior job (not the one from which I was recently unemployed). Will this affect the amount of my UI benefits? What if I receive more benefits than I’m supposed to? Do I have to pay the state back? I don’t think my employer reported all of my earnings. What do I do? My unemployment insurance benefits are about to expire- can I receive an extension? 1. How much will I recieve in Unemployment Insurance benefits? To determine what UI benefits you are eligible to receive, your state will typically review your prior wages and hours within a period of time known as a “base period”. In a regular base period, the first four calendar quarters of the last five you worked before your unemployment claim, determine your amount of compensation. Remember that a calendar year has 4 quarters. In other words, your eligibility is decided based on the first 12 out of the last 15 months you worked. a proportion of one’s total wages during the highest three-month period (“quarter”) in the base period. Each state has a minimum and maximum weekly benefit–ranging from $5 in Hawaii to $722 in Massachusetts. It is important to review the history of your earnings in order to ensure that your benefit rate is accurate. 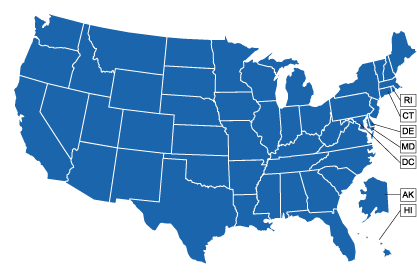 For information on your state, click on your state in the map below. Some states allow eligibility under an “alternate base period” (ABP), which includes more recent earnings than the regular base period. This is especially helpful for people who were not employed throughout the previous year and a half or who began earning more income at the end of their employment. As a result of the ABP, you may be found eligible when previously ineligible, or your benefit rate may increase significantly. Some states do not automatically evaluate eligibility under the ABP, so it is important to ask about it or to request evaluation under the ABP. 2. How many weeks of benefits and I eligible for? States vary on this as well. Most states provide Unemployment Insurance for a maximum of 26 weeks. Currently only two states offer a higher maximum: Montana with 28 weeks, and Massachusetts with 30. There are a handful of states that provide less than 26 weeks. You should check with your state agency to determine the specific duration of your unemployment benefits. Those who receive benefits while working part-time may be eligible for an equivalent amount of benefits spread out over a longer period of time (52 weeks at 50% of the weekly benefit rate). The duration of benefits is for a single benefit year. At the end of the year, one may be eligible to receive benefits for a subsequent benefit year based on earnings that were not already used to qualify for benefits in the prior year. 3. When I left my job, I was given a severance package. Will this affect the amount of my UI benefits? Depending on how your employer handles your severance pay, a severance package may or may not affect your UI benefits: the rules vary from state to state. If you received severance pay from your employer, you must report the amount you have received. In some states, the severance is considered income and may offset any unemployment compensation to which you are entitled. Your employer may choose to pay severance as a “lump sum”, or gradually over time. If you are being paid severance over time, this may be considered a “salary continuation”. Salary continuation, when you stay on the payroll for a certain number of weeks after you stop working for the company, will usually make you ineligible for unemployment for as long as the employer continues to pay your salary. If your employer pays you severance all at once in a lump sum, you may or may not be entitled to unemployment benefits. If the lump sum is just an upfront payment of a number of weeks of your pay, the agency may treat the payment like salary continuation. You will be ineligible for benefits for the number of weeks of severance you received. Apply for unemployment compensation even if you are receiving severance and. begin the paperwork immediately. If your severance runs out before you find another position, you can simply send in a request for compensation and the original administrative steps that you took will speed up the process of payment. 4. I collect a pension from a prior job (not the one from which I was recently unemployed). Will this affect the amount of my UI benefits? If you are actively ready, willing, and able to work, you may still be eligible for UI benefits. If you are receiving a pension because you are truly retired and not looking for work, you will be ineligible. Rules vary from state to state. Often, the value of the pension will offset to some extent the amount of UI benefits you can receive; in some cases, your benefits will be affected by the amount your employer contributed toward your pension. 5. What if I receive more benefits than I’m supposed to? Do I have to pay the state back? Yes, without exception. If you have been overpaid UI benefits, you may receive a notice from your state agency alerting you to the overpayment. If you believe that your state agency is incorrect, you may request a waiver or appeal the decision. If your waiver or appeal is denied, or if you do not dispute the claim, you will have to begin repayment. In many cases, your future unemployment benefits will simply be lowered until the amount has been repaid. In other cases, they may attempt to collect from your tax return or use a debt collector. If you intentionally provided inaccurate information to your state UI administrator or knowingly filed a false claim to receive more benefits, you have committed unemployment insurance fraud. In addition to having to repay your state agency, you may be subject to: penalties, criminal charges, ineligibility of UI benefits, and forfeiture of tax returns. All states actively monitor UI fraud. To avoid these repercussions, provide truthful and accurate information to your state UI administrator at all times. If you feel that you have made a mistake on your forms or during the application process, call your state agency immediately. If it is found that your employer willfully underreported or failed to report your earnings, he or she has committed fraud. 6. I don’t think my employer reported all of my earnings. What do I do? Once your regular unemployment insurance have expired, some states offer an “Extended Benefits” program that can provide between 7 and 13 additional weeks of unemployment insurance benefits during a period of particularly high unemployment within a state. The extension for each person can vary however, resulting in extensions of less than 13 weeks or more than 20 weeks. Trade Readjustment Allowances and Disaster Unemployment Assistance do not need to be exhausted before Extended Benefits can be received. The Extended Benefits program continues the regular amount of unemployment insurance that you currently receive, but all those who receive unemployment benefits are not automatically eligible for extended benefits. Those receiving unemployment insurance benefits will be notified if their state enters a period when Extended Benefits are available. 7. My unemployment insurance benefits are about to expire- can I receive an extension? At our site’s listing of state government agencies, you can find the contact information and web links for the agency in your state which oversees the unemployment compensation program in order to obtain further information about the laws in your state concerning unemployment benefits.